The Fusion BT100 Bluetooth Interface. Connect your Bluetooth Media Player or Phone to any Stereo with an auxiliary input. 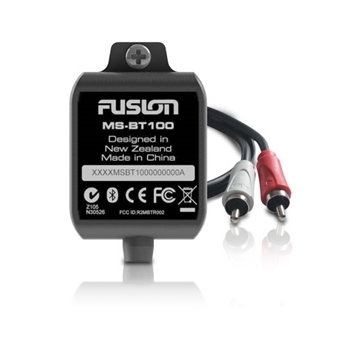 The Fusion MS-BT100 is a Marine Bluetooth Module that allows you to stream audio from your iPhone, Android, Blackberry, Windows Smartphone, or any other compatible Bluetooth A2DP enabled device to your marine stereo. The MS-BT100 is water resistant and specially constructed for the harsh marine environment, complying with the IP65 standard. Enjoy music uninterrupted from anywhere around your vessel with the 10 Meter Effective Range feature. With the MS-BT100’s Direct Media Device Control feature you can also conveniently select tracks, albums, artists or playlist directly from your Smartphone or Bluetooth compatible device. With most smartphones there is no need to worry about missing a call. When you receive an incoming call the music automatically pauses allowing the ring tone to be played through your smartphone speaker. This enables you to answer and use your phone as you normally would. Once the call is completed the music starts back. The MS-BT100 is also easy to install and includes a 1.5 Mtr (5 Ft) cable so the Bluetooth module may be mounted in the prime location for exceptional audio streaming performance. The MS-BT100 is compatible with the following FUSION Marine Stereos: MS-CD80, MS-RA50, MS-IP600, MS-AV600, MS-CD600, MS-RA200, MS-RA205, MS-IP700, MS-AV700, MS-IP700i and MS-AV700i, CA-CD700 and CA-ML600.